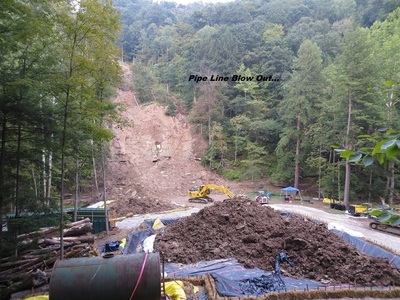 The 600-mile, 42-inch diameter interstate gas transmission pipeline proposed by Dominion Resources and partners in May 2014 and modified in Feb. 2016, crosses the Allegheny and Blue Ridge Mountains from WV to NC, and would require the cutting of a permanently maintained 75-100 ft. swath through 16 miles of the George Washington National Forest in Highland, Bath, and Augusta counties. 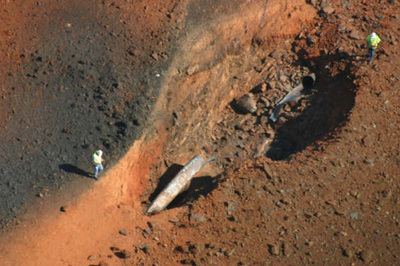 A road would likely parallel the pipeline. 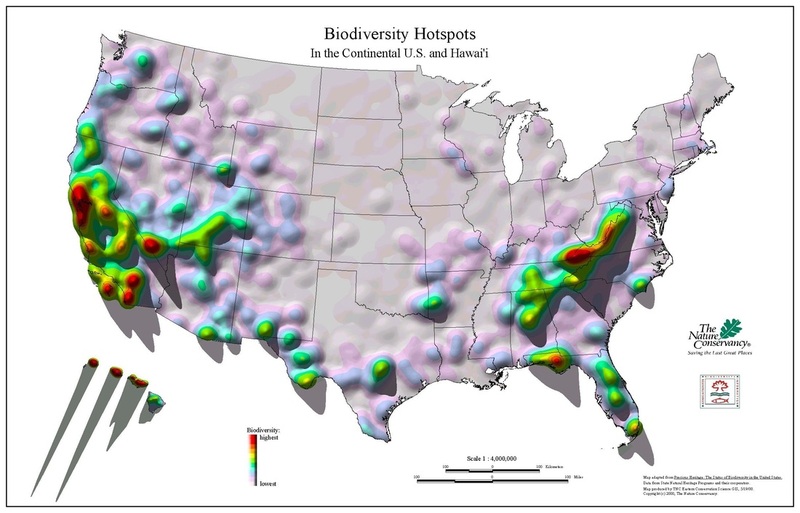 This long, wide industrial zone would severely degrade some of the best remaining, least altered natural landscapes in the Eastern U.S., contained in the GWNF. The GWNF is the largest National Forest in the east and has the most - and largest - roadless areas. The new ACP route proposed in Feb. 2016, threads its way through the heart of the GWNF, which has the largest concentration of roadless areas on National Forest land in the Eastern United States. 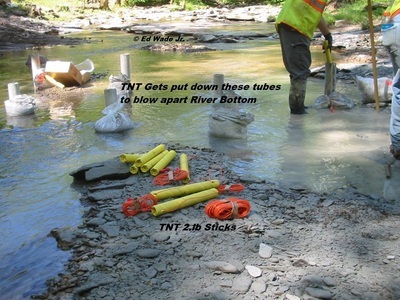 Extreme disruption of many pristine rivers and native trout streams, wetlands and riparian areas, through bedrock dynamiting and excavation, including Ramseys Draft, Cowpasture, Calfpasture and Jackson Rivers, Back Creek near Sherando, and headwaters of Rockfish River. Some of these rivers provide habitat for rare mussels and feeding sites for bald eagles. Long open entrance routes for a variety of nonnative, invasive species. Through Horizontal Directional Drilling (HDD) under the Blue Ridge Parkway and Appalachian Trail in Augusta and Nelson counties with a high impact on surrounding lands for pull-back, and staging areas and access roads, and with high potential for pollution of surface and ground waters from drilling muds and fluids and potential chemical spills. 2. Passage through Inventoried Roadless Areas and Special Biological Areas in the GWNF. 4. Passage through special areas identified in VWC’s publication, Virginia’s Mountain Treasures in the GWNF. 5. Significant deterioration of nationally known and highly popular recreational features. 6. 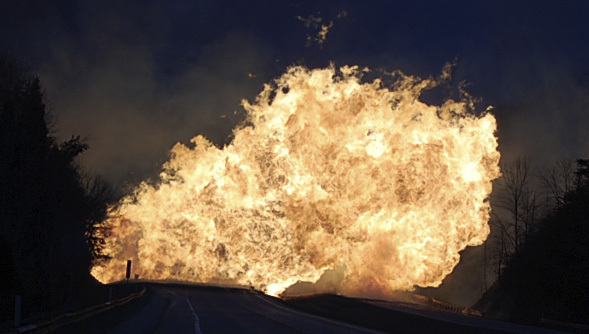 Increased possibility of hydraulic fracturing and the extreme degradation this would cause. 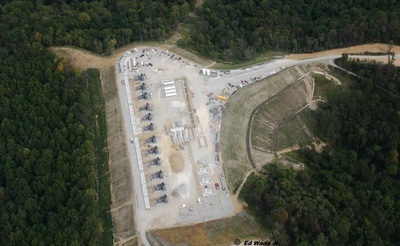 The Dominion pipeline route passes through a "biodiversity hotspot" identified by The Nature Conservancy. 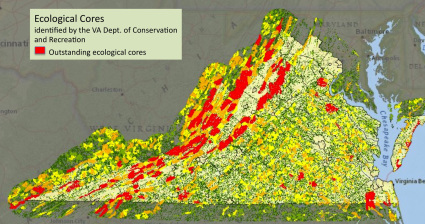 The Dominion pipeline route passes through some of Virginia's Outstanding Ecological Cores. 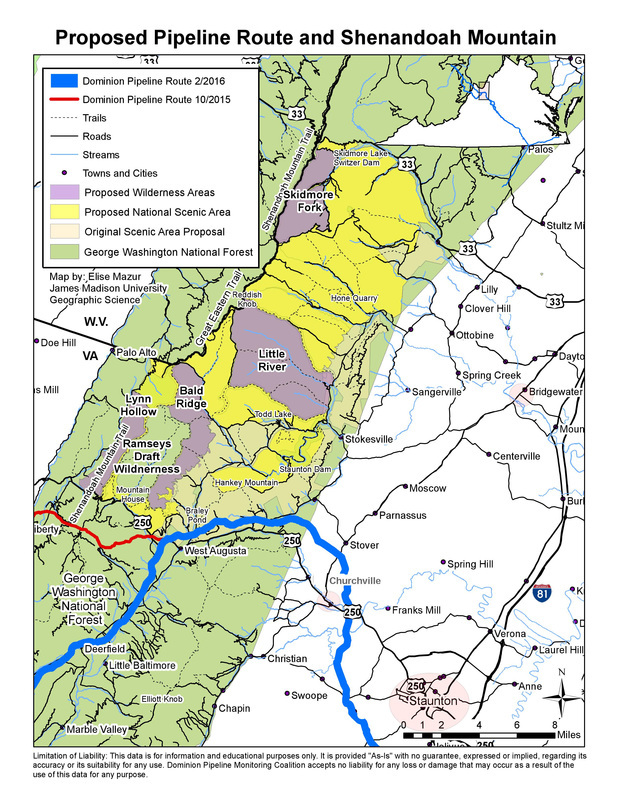 In Feb. 2016, Dominion proposed a new route for the Atlantic Coast Pipeline that avoids Shenandoah Mountain, Cheat Mountain, and Red Spruce restoration areas in West Virginia. 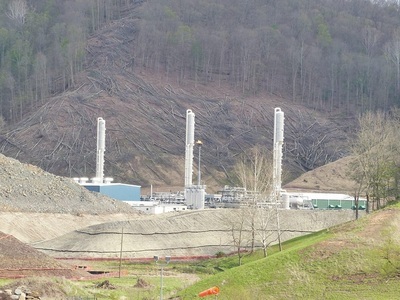 The new route circumvents Shenandoah Mountain by going around its southern end in Bath County and then through the Deerfield Valley to reconnect with Dominion's preferred route at West Augusta. Click on the map below to connect to an interactive map, developed by Dominion Pipeline Monitoring Coalition and Allegheny-Blue Ridge Alliance. Read about a whole host of problems with the new route, such as plowing through five Special Biological Areas, an Inventoried Roadless Area, an Eligible Recreation River, and much more. 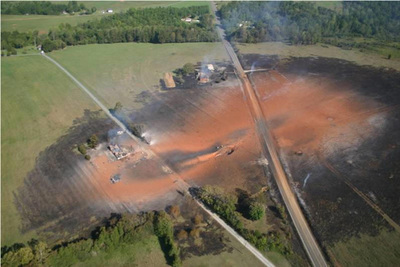 The Federal Energy Regulatory Commission issued a Draft Environmental Impact Statement for the ACP on Dec. 30, 2016. Public comments are due April 6, 2017. 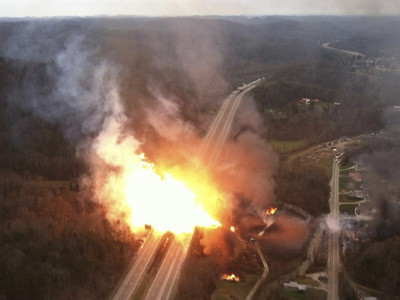 Dominion and FERC asked for an expedited timetable for review. The USFS initially pushed back, saying they needed more time to gather all enough information for responsible decision. The dreaded application for the Atlantic Coast Pipeline was filed with FERC on Sept. 18. The ACP route has many problems as it passes through the George Washington National Forest, which are detailed in VWC's rationale for opposition. One major problem is that the pipeline route passes over Shenandoah Mountain through Cow Knob Salamander habitat, which is protected by a Conservation Agreement signed in 1994 by the USFS and US Fish & Wildlife. GWNF Forest Supervisor Tom Speaks sent a letter to FERC on Sept. 17 asserting that the ACP is not in compliance with the Conservation Agreement for this species which is "at high risk for extinction or extirpation." Supervisor Speaks added that "project effects on Cow Knob and Cheat Mountain salamanders must be avoided and cannot be mitigated." ​On Jan. 19, 2016, the Regional Foresters for the Southern and Eastern Regions sent a letter to ACP saying the proposed route does not meet minimal criteria for a special use permit and that ACP should develop a new alternative that avoids Shenandoah Mountain and Cow Knob Salamander habitat. Even tunneling under Shenandoah Mountain would still endanger the Cow Knob Salamander. The ACP route would pass near the edge of our Shenandoah Mountain Proposal in the Braley Pond - Hankey Mountain - Rt. 250 area, permanently marring a major gateway to the proposed Shenandoah Mountain National Scenic Area. FERC issued a Final Environmental Impact Statement for the ACP by the on July 21, 2017. 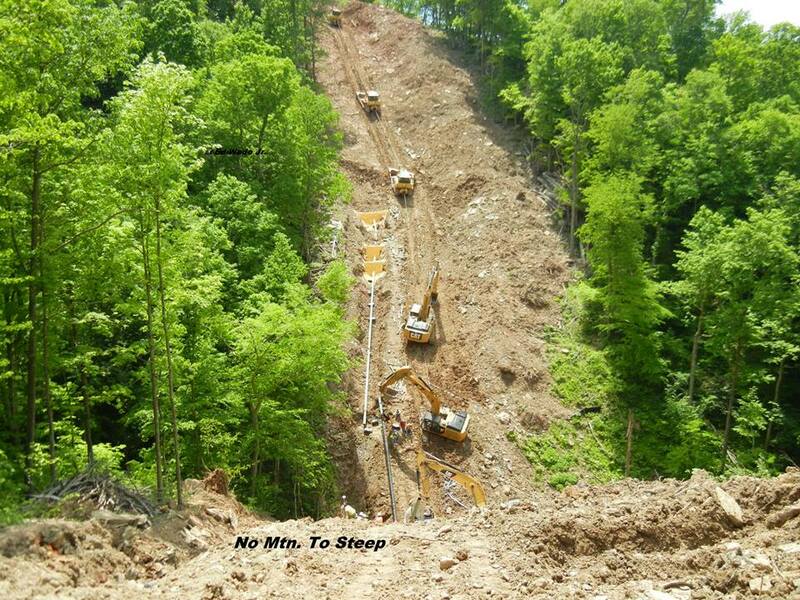 On July 21, 2017, The Forest Service Issued a Draft Decision to Permit the Atlantic Coast Pipeline Project on National Forests in West Virginia and Virginia. The draft decision calls for amending the forest plans for the GWNF and Monongahela to exempt the ACP from relevant standards. This was a real reversal in direction that was very disappointing. On Sept. 5, 2017, The Southern Environmental Law Center filed an objection to the Forest Service's draft decision to permit the Atlantic Coast Pipeline. The objection was filed on behalf of VWC and several other organizations. Virginia DEQ has the ability to deny a 501 certification for the Atlantic Coast Pipeline. North Carolina and West Virginia have both held back on granting 501 certification. What will Virginia do?